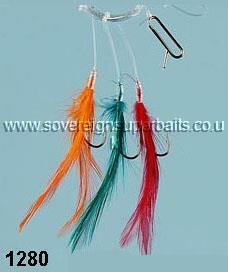 A new range of three hook mackerel feathers, tied for us by Dennett of Northern Ireland. 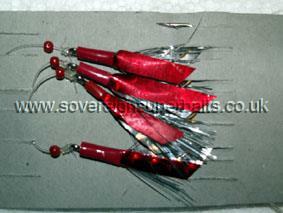 These mackerel feathers are purpose built / tied 3 hook rigs, not 6 hook rigs cut down. 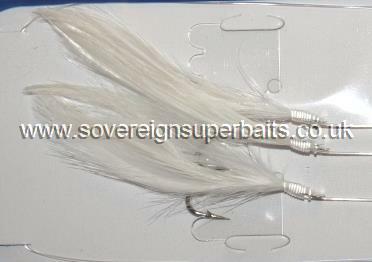 They are tied on nickle plated size 1/0 short shank, spade end O'Shaughnessy "ultrapoint" hooks. 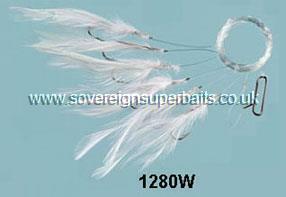 Just 4'/122cm from loop to loop, these mackerel feathers are perfectly manageable on boat or shore. 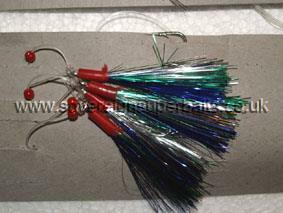 : These are tied exclusively for us in the UK on 0.6 crystal clear mono with Size 3/O, bright tinned O Seanessy hooks generously furnished with a large bunch of highly reflective tinsel and / or flasherfoil. We have not wasted your money on fancy packaging to go in the bin. They are mounted on plain grey card in a polythene bag. This enables us to supply them around 30% cheaper. 4 hook, Size 3/O tinned O'Shaunessy, 0.5 crystal clear mono. 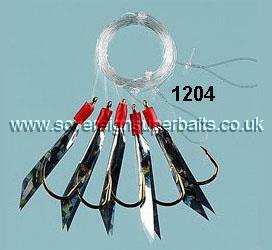 with 5 size 3/0 or size 2 long shank tinned Aberdeen hooks (link to 7/O version here). Dressed with green feathers, Mylar piping & fish skin, caped off with a lumo white hokkai & lumo bead. 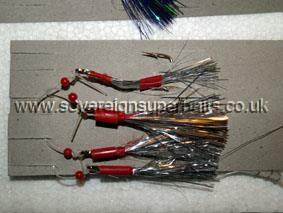 All tied on .6mm/40lb mono or .5mm/25lb mono respectively. 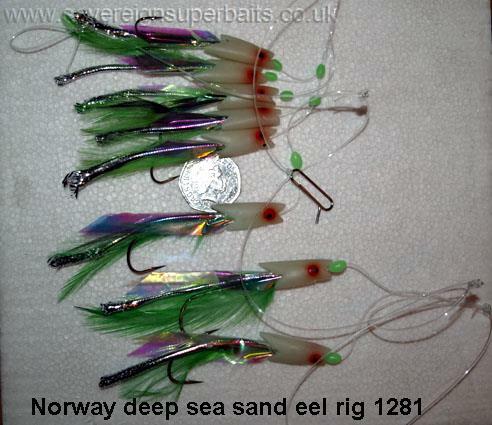 You will be pleasantly surprised with what you will pull up on these, we have had all sorts of unusual catches on these, Bass, Gurnard, Place, Cuttlefish & even Mullet ! And of course in mid water they fill the bait box with fresh Mackerel in no time. It seems everything likes a sand eel !